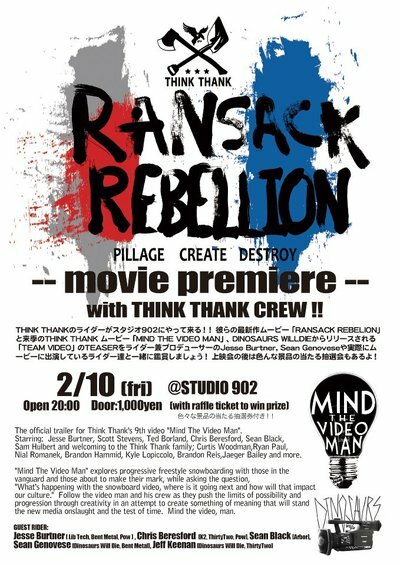 RANSACK REBELLION Movie Premiere with THINK THANK CREW!! Think Thank is proud to release the trailer for it's 9th video project "Mind The Video Man." Please feel free to take this You Tube link and video description below and post it to your media . Also attached is Think Thank 2012 Media Kit. The official trailer for Think Thank's 9th video "Mind The Video Man". Starring: Jesse Burtner, Scott Stevens, Ted Borland, Chris Beresford, Sean Black, Sam Hulbert and welcoming to the Think Thank family; Curtis Woodman, Ryan Paul, Nial Romanek, Brandon Hammid, Kyle Lopiccolo, Brandon Reis, Jaeger Bailey and more. "Mind The Video Man" explores progressive freestyle snowboarding with those in the vanguard and those about to make their mark, while asking the question, "What's happening with the snowboard video, where is it going next and how will that impact our culture." Follow the video man and his crew as they push the limits of possibility and progression through creativity in an attempt to create something of meaning that will stand the new media onslaught and the test of time. Mind the video, man.